At an event organised jointly by EDC-Free Europe campaign partner the Health and Environment Alliance (HEAL) and Member of European Parliament Pavel Poc in the European Parliament on 24th May, several MEPs, national governments’ representatives and scientists echoed HEAL’s call on the European Commission to come forward with an updated European strategy for endocrine disrupting chemicals (EDCs) as soon as possible. The current strategy dates back from 1999 and earlier attempts to update it have failed, most notably due to significant interference from corporate lobbying. An EU EDC strategy is needed in big part because EDC-related legislations at the European level are full of loopholes, which leave significant protection gaps for human health and the environment. Beyond the REACH framework, which aims to protect public health from the risks posed by chemicals, and the biocides and pesticides legislations (for which EDC identification criteria have only recently been agreed), important areas that constitute major sources of exposure to EDCs - such as toys, cosmetics, or food packaging - need to be addressed. 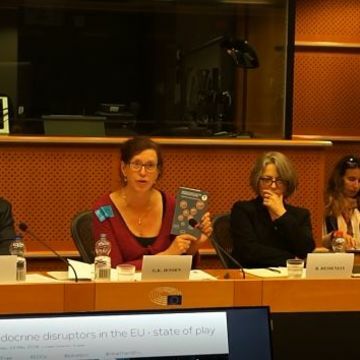 The event provides a state of play of the current legislations on endocrine disruptors, as we are nearing the end of this European Parliament and Commission term and it also set out priorities for action for the future. Speakers featured representatives from the European Commission (Secretariat General and DG Sante), national governments (Denmark, France, and Belgium), the scientific community and the environmental health community. Professor Barbara Demeneix outlined the scientific evidence that underpins the serious health concerns linked to exposure to endocrine disrupting chemicals, emphasising the significant effect that early life exposure has for disease development later in life. This calls for particular concern, considering that babies are nowadays exposed to about a hundred chemicals. She called for a strong investment in research to further develop the scientific evidence and the mechanisms at work, which should be an integral part of a future strategy to address EDCs in an effective way. Member States’ representatives present at the event all called on the European Commission to lead on the issue. Mr Henrik Søren Larsen, from the Ministry of Environment and Food in Denmark, addressed the implications of the current EDC identification criteria and scientific guidance for future substance evaluation. He raised concerns about how the burden of proof needed to identify a chemical as a hormone disruptor is currently too high, and that inconclusive results are likely to occur. Besides MEP Poc, MEPs Schaldemose, Guteland, and Hazekamp also joined the event, which they closed by re-emphasising the need for the European Commission to act and to take the concerns of European citizens seriously. Mr Julien Mousnier from the European Commission Secretariat General who was present at the event acknowledged the concerns raised and emphasised that it is high on the EU agenda. Although he could not provide specific details or a timeline for the development of the new strategy, he stated that the Commission is working on it and the updated EDC strategy will come. The presentations of Klaus Berend, representative of DG Sante, Professor Barbara Demeneix, Henrik Søren Larsen, Aude Charrier, environment counsellor at the French representation to the EU, and Cindy Franssen, senator and member of the Flemish parliament, are available. The event was livestreamed on the Facebook page of MEP Pavel Poc. HEAL gratefully acknowledges the support of the European Environment and Health Initiative (EEHI) and the European Union (EU) for the production of this event. The responsibility for the content lies with the organisers and the views expressed do not necessarily reflect the views of the EU institutions and funders.